Roulette may translate as “little wheel,” but a lot of casino patrons are intimidated by the roulette table. The game has been around since the end of the 18th Century but has changed very little in that time. Even online roulette wheels are designed to look and play just like the real thing. It doesn’t take long for bystanders to pick up on the objective of the game, the harder part for most first-time roulette players is learning how to use betting layout. Before we tackle the roulette rules, it’s important for beginners to know that there are actually two kinds of roulette games out there: French/European roulette and American roulette. The difference between these two games – one slot – may seem tiny, but it makes a big difference when calculating the odds for certain bets. Both games feature the same wheel with black and red numbers ranging from 1-36, and both also have a single green 0 slot, but the American wheel also has one additional green slot marked 00. Traditionally, European roulette puts the wheel at the center of the table with the betting layout extending from both sides. American roulette, on the other hand, has the wheel at the head of the table with the entire betting layout extending from it. The action at the roulette table revolves entirely around the wheel itself. The roulette wheel has a convex, paneled center that is divided into numbered slots. The slots may be red, black or green. Every slot on the wheel is represented by a square on the betting layout that is printed on the game’s table. At a live roulette table, a casino employee known as the “croupier” collects bets and spins the wheels. 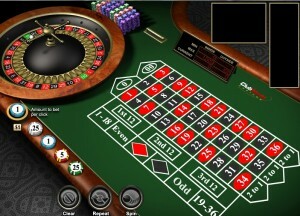 An online roulette game may have an animated croupier, or it may spin the wheel automatically. Playing roulette is extremely simple since bettors need only stand back and wait for the result of every spin. It’s the act of placing a bet that confuses and intimidates so many first-time visitors to the roulette table. For that reason, most of the roulette rules cover betting. If you’re new to online roulette, then the first thing you need to know is that there are two kinds of bets: inside bets and outside bets. Inside bets deal specifically with numbers, whether that’s a bet on a single number (called a “straight-up” bet) or a bet on a group of numbers. Outside bets are placed on large groups of slots that share common features like even or odd, red or black, high or low, etc. While inside bets are popular with superstitious beginners, smart players stick to the outside bets because they offer the best odds. A Playtech and IGT powered casino that features a huge variety of top rated games. One lucky winning collected £5.1m in Beach Life game back in 2012 and multimillion £/$/€ jackpots are regularly on offer. A fully featured casino from a household name in the UK; Betfred is a very reputable brand and is licensed by the GRA in Gibraltar.